This morning we realized just how cold winter in South Africa can get. 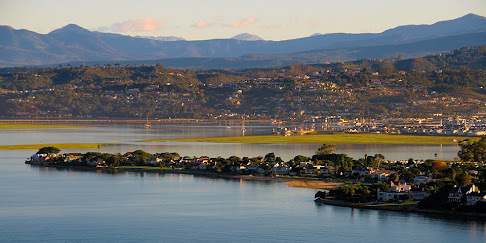 We suffered bone-chilling temperatures through the night in Knysna, and the cold, damp air blowing off the nearby water seemed to penetrate straight through my sleeping bag unless I completely enclosed the opening around my face. Many of the overland trucks do not run tours during the winter in South Africa because they consider it too cold for camping. But at least the sunny days thaw us out and keep us going. After packing up our tents and warming ourselves with some steaming tea, we traveled a short distance to the Heads, the two rocky promontories that shelter Knysna's calm estuary from the open sea. Although the scenery at the Heads is stunning, with the powerful waves crashing against the imposing cliffs, I was not focused on the moment. In an hour and a half, we would arrive at Bloukrans Bridge, the highest single span arch bridge in the world and site of the highest bungee jump on Earth! At a vertigo-inducing 708 feet above a rugged gorge that opens to the Indian Ocean, this jump is almost twice the height of the jump at Victoria Falls. After a terrifying experience at Vic Falls, I vowed never to bungee jump again, but I couldn't resist the challenge of the world's highest jump. Maybe jumping out of a plane in Namibia has made me a bit more courageous, or maybe I'm just dedicated to the gung-ho philosophy I have set for myself on this world trip. I am traveling the world because I want to get the most out of my time on this planet. I want to live without regrets. I quit my stable job to go on this trip – surely I can find the courage to jump off a bridge! I've done it once, and even though I didn't like it the first time, most things in life deserve a second chance. Of twelve passengers and three crew, only two of us dared to jump. Heleen, a Dutch girl who was also jumping, accompanied me to the registration office. We signed the necessary liability forms and headed to the harness-fitting area. 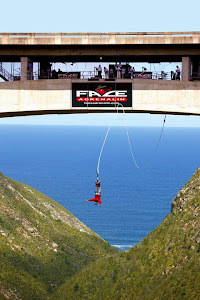 The process at Bloukrans was much faster than the over-crowded affair at Vic Falls, which lasted most of the day – wincing as jumper after jumper plunged from that bridge only degraded any shred of fortitude I had left. 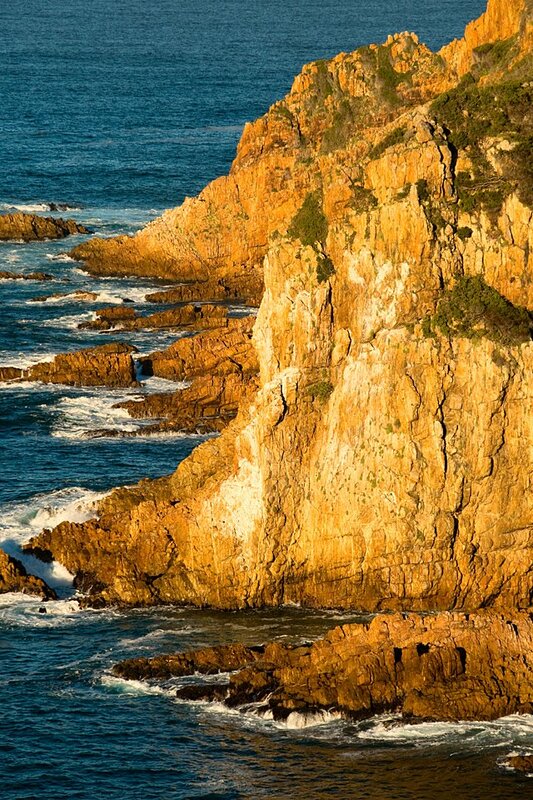 At Bloukrans, I was standing on the edge of the bridge within thirty minutes of registering. 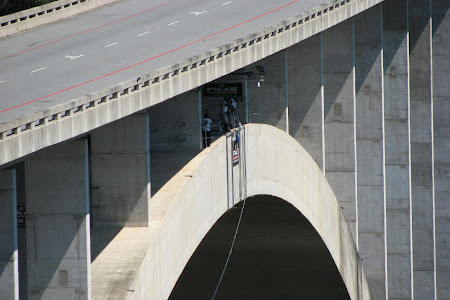 The enclosed walk to that point of no return at the center of the bridge helped me to maintain my courage until the last minute; any grand, terrifying view of the gorge was obscured by the concrete supports of the bridge and the metal grating of the catwalk. 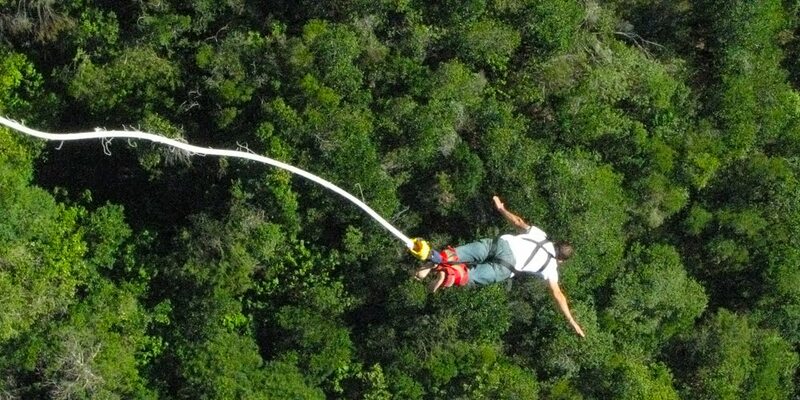 The dizzying vista was not revealed until the final seconds, when I hopped to the edge of the platform, my feet bound together and tethered to the bungee cord. I gripped my toes around the cold metal edge of the platform as the intimidating depth of the chasm took my breath away. Three. Two. One. Adrenaline pumping, I bent my knees, spread my arms, and dove headfirst into the abyss, surrendering the last trace of anchoring comfort provided by that tiny metal platform. 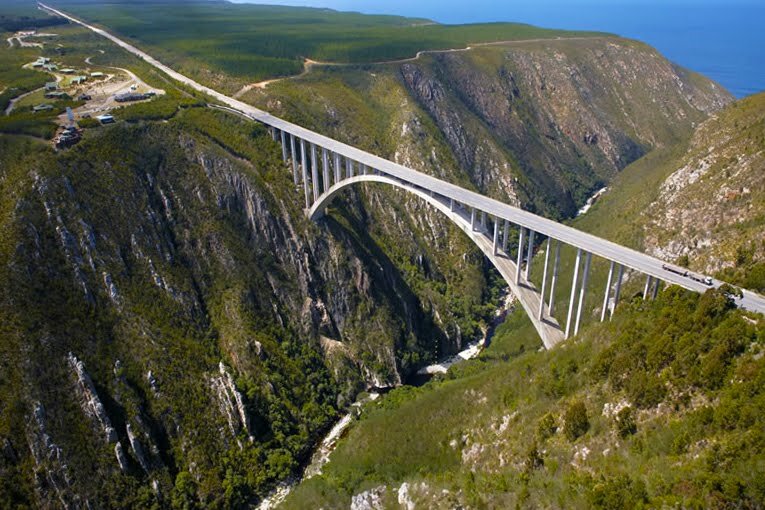 I plummeted towards the Bloukrans River below at breakneck speed. 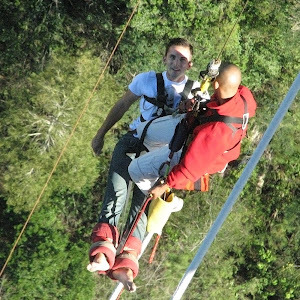 The bungee cord stretched after only seconds, and I bounced back towards the bridge. For a brief moment of calm, I was weightless, and I caught a wedge-shaped glimpse of the deep blue Indian Ocean at the end of the gorge. Suddenly, I accelerated once more, the intense g-force pulling the blood to my head as the cord seemed to strain to the limit. I continued to oscillate in an ever-diminishing yo-yo pattern until I eventually equalized and came to a stop, dangling by my feet in the center of the immense gorge. I craned my neck to look up towards my feet so the blood wouldn't pool in my head. Soon, a man in a harness descended and hoisted me back up to firm footing on the bridge. As terrifying as it was to jump at Bloukrans, I preferred it to the Vic Falls jump because I didn't twirl while suspended from the cord. Bloukrans was more about the intense yo-yo effect. 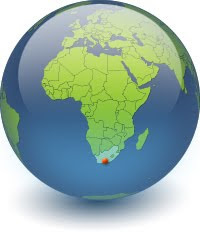 In fact, the first bounce at Bloukrans is actually higher than the entire jump at Vic Falls. 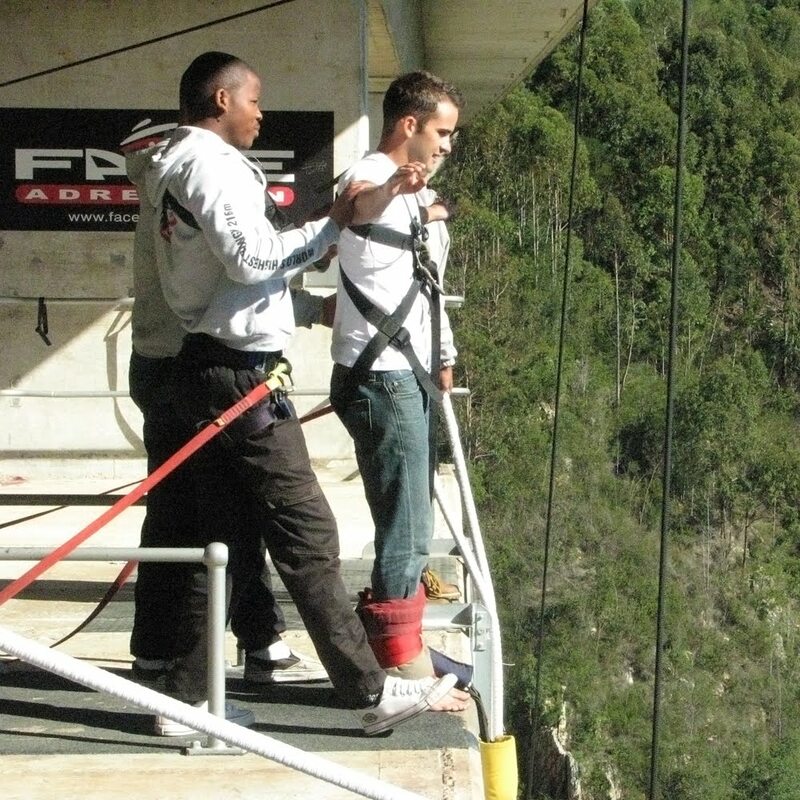 The initial fall is such a minuscule part of bungee jumping, as it lasts only a few seconds even from a height such as Bloukrans. This is the reason that I find skydiving to be much more enjoyable – the free-fall lasts for so long that it feels like flying rather than falling. Nevertheless, bungee jumping takes more courage than tandem skydiving. The height is more real and immediate, and it is incredibly difficult to work up the will to leap from that platform. In tandem skydiving, the instructor takes the plunge for you – you're just along for the ride. 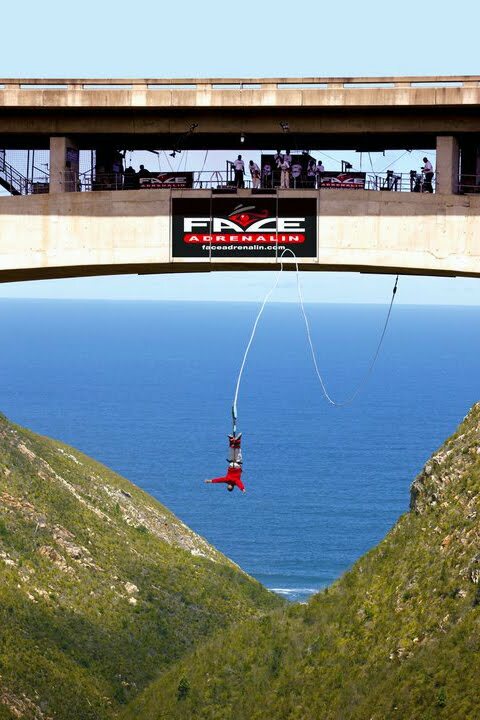 After successfully tackling the world's ultimate bungee jump, I don't feel the need to ever jump again. But I'll never say never. It was a short distance to the campsite in Stormsrivier, and I felt drained after all the terror and excitement of the jump. In the afternoon, I embarked on a zip-line canopy tour through the ancient Tsitsikamma forest. Some of the trees there are over six hundred years old. For the second time today, I put on a harness, and we journeyed into the woods. There were ten zip-lines strung high above the ground between wooden platforms built around the massive trunks of some of the tallest trees. Any other day, I would have enjoyed zooming through the trees along these zip-lines, but jumping from that 708-foot bridge earlier had numbed my capacity to experience any thrill from these comparatively tame heights. I simply relaxed and enjoyed the tranquil forest setting. After we had crossed four or five of the lines, the wind began to pick up and the sky grew overcast. Half an hour before, there was not a cloud in the sky, so the change in weather took us by surprise. We felt a few cold raindrops that filtered through the dense canopy. We were now focused only on getting out of the forest before we had to contend with a downpour. As the wind grew stronger, the towering trees began to sway and creak, and we had to wait for a brief lull each time we prepared to glide across one of the lines. Every once in a while, we would hear a loud crack, and we had to be on the lookout for falling branches. We made it to the last zip-line just as the rain started falling, and we all quickly slid across and ran to the shelter of the waiting truck.